Manufacturers of High Quality Glass partitions. With a firm commitment to quality, our organization is engaged in offering a wide ambit of Glass Partition. Color Transparent Size Customized Glass Option Tempered, Clear, Tinted, Low-E, Reflective, Laminated glass and double glass We are keenly instrumental in presenting a comprehensive collection of Glass Office Partition. We provide a broad range of Glass Partitions which are used to enhance the look of offices. It basically represents a clean and sleek look which spreads a feel of professionalism among employees and in entire office. We offer Glass Partitions in different sizes and shapes which are sourced from well known vendors. We deliver them to clients on time in a safe manner. Facilitated with highly-advanced processes at our sophisticated manufacturing house, we are providing a broad variety of Glass Partition. Our offered partition is designed using premium grade glass and other allied material with the help of cutting-edge techniques under the surveillance of our highly experienced professionals. 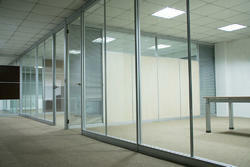 In order to cater the variegated demands of our clients, we are offering an excellent quality range of Glass Partition. Glass gives your partition walls a high-quality appearance and creates light, open rooms. Its soundproofing properties allow you to work undisturbed and in peace - ideal conditions for offices and home.